This edited volume looks at whether it is possible to be more transparent about uncertainty in scientific evidence without undermining public understanding and trust. With contributions from leading experts in the field, this book explores the communication of risk and decision-making in an increasingly post-truth world. Drawing on case studies from climate change to genetic testing, the authors argue for better quality evidence synthesis to cut through the noise and highlight the need for more structured public dialogue. For uncertainty in scientific evidence to be communicated effectively, they conclude that trustworthiness is vital: the data and methods underlying statistics must be transparent, valid, and sound, and the numbers need to demonstrate practical utility and add social value to people’s lives. 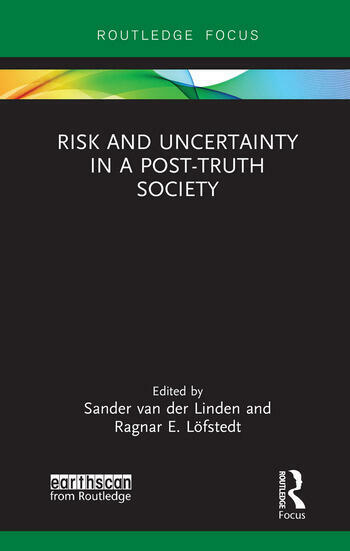 Presenting a conceptual framework to help navigate the reader through the key social and scientific challenges of a post-truth era, this book will be of great relevance to students, scholars and policy makers with an interest in risk analysis and communication. Sander van der Linden is Assistant Professor of Social Psychology at the University of Cambridge, UK, where he directs the Cambridge Social Decision-Making Laboratory. Ragnar E. Löfstedt is Professor of Risk Management at King’s College London, UK, and Director of King’s Centre for Risk Management.